"Cortona: Island in the Sky"
Enroll early to secure your place! Let the fabulous Italian countryside, and the towns and villages of Tuscany inspire you to create beautiful ribbonwork memories. 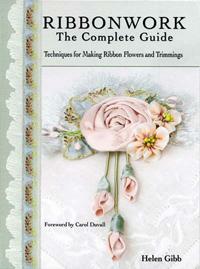 During this workshop you will learn a wealth of Ribbonwork Flower Techniques and then use those skills to create some very special projects. See how small snips of ribbon can be converted into delightful poppies and sunflowers - yes the same ones that cover the fields in Tuscany - and then combine them with other ribbon flowers, blossoms and leaves into a Tuscan Flower Garden. You will also learn a few simple stitches in Silk Ribbon Embroidery which will be combined with ribbonwork flowers, beads and buttons to embellish small fabric prints with a decidedly Tuscan theme. Some of these prints will be made into Artist Trading Cards for you to share with your fellow classmates - a nice souvenir of each person's talents! Other fabric prints will be used with Ribbonwork Flowers and Silk Ribbon Embroidery to embellish an album cover or similar item of your choice. There will be a required kit of approximately $225.00. We'll be working on a 12" block made of silk fabric and decorator fabrics. And of course the embellishments for the block will be designed to reflect our Italian holiday. We'll also make a charming brooch of ribbon flowers and leaves. the joy of creating ribbon treasures in a relaxed and inspiring atmosphere with the expert instruction of a nationally know artist and instructor and the camaraderie of a small group of learners. Each day we will work on techniques for the project. The mornings will be spent partly in the classroom and partly outside the classroom. Some mornings we may go for a roam around town looking for flowers to inspire us and to grab a coffee as well! Afternoons will be dedicated to applying what we've learned in the previous days. We'll also go on some field trips - one to Siena and another day trip to visit Florence with a visit to the Uffizi Gallery included! To round out your Italian experience we'll also enjoy a Tuscan cooking class, several wine tastings and fabulous Tuscan meals...all in the wonderful ambiance of one of Tuscany's true hill-town jewels! *Special materials kit fee is not included and is the responsibility of each participant. $3190.00 per person single occupancy! 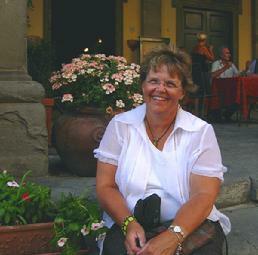 Escorted group travel from Florence to Cortona available...see details below. June 2 Saturday – Check-out - Morning Check-out and departure from Cortona. Offered from Florence airport only on May 26, 2012. We depart Florence airportat approx. 12:13pm. Helen will ship your kit to you one month prior to your departure to Italy. Because of the tight security regulations at airports pack your scissors in your checked baggage or they will be confiscated. Your project kit needs to be carried in your carryon hand luggage to ensure that it arrives with you. Kit fee in not included in the workshop price and is the responsibility of each participant.